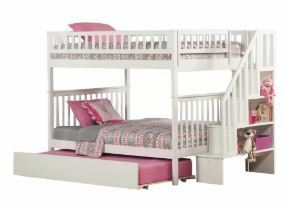 The Shyann Bed with Trundle features detailed matching guard rails and end panels. Constructed using sturdy hardwood. Weight Capacity Bottom Bed or Futon: 400 lb. Weight Capacity Top Bed: 400 lb.